Includes one bargain colonial man wig. The wig features an elastic band for a comfortable and secure fit to almost any head size and is available in a wide variety of colors. Use this wig to create a colonial period look for book reports, school projects, period plays, and historical costumes. 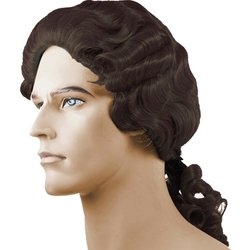 This wig has a combed back top, barrel curls on the side, and is pulled back in a ponytail that is tied off with a ribbon. The Bargain Colonial Man wig is perfect for the Character of Gaston in Beauty and the Beast. While Gaston isn’t an evil character he is definitely the “bad guy” in the story Beauty and the Beast. He show’s a love interest in the main character Belle, and when spurned by her becomes determined to get her to love him no matter what it takes. Directors choose to go with a colonial wig for his hair style in a darker color. Don't forget a wig cap for a more secure fit and a wig stand to help organize your wigs and keep them neat, tidy, and expand the life of the wig.